It begins around the dining room table of my childhood. We are gathered there after a harried morning of getting ready for, attending, and coming home from church. 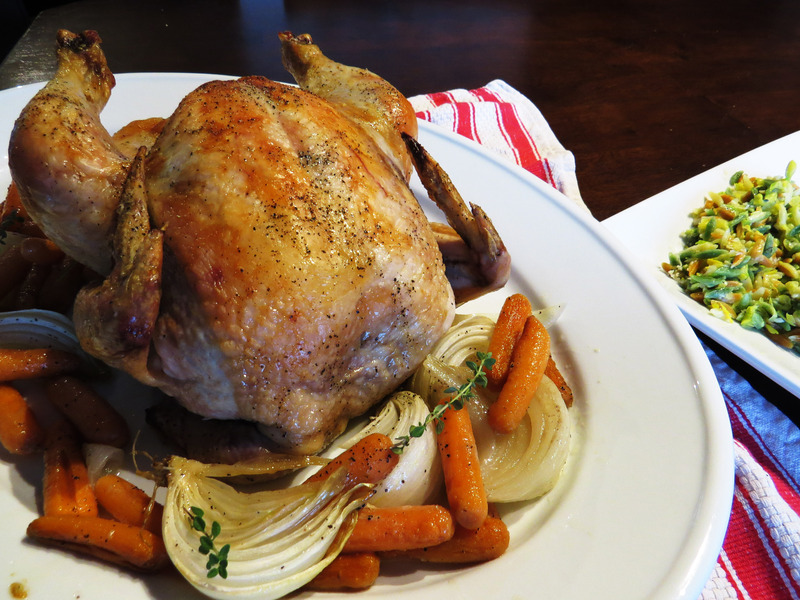 My siblings and I are fighting over who gets the “chicken bones” on this week’s rotisserie bird. (My mom, wise as Solomon, later created a chart tracking whose turn it was for the coveted legs.) 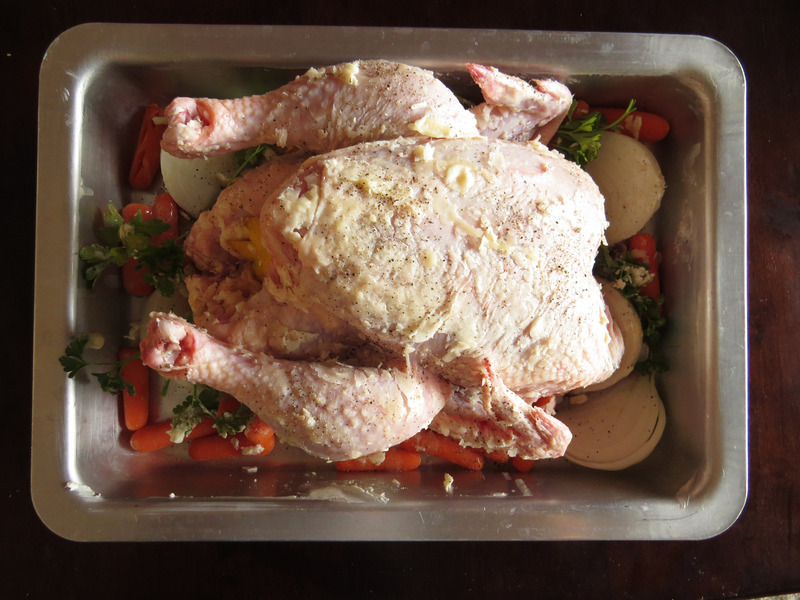 The poultry came swaddled in a plastic roasting bag and was always served with a side of Lipton Alfredo noodles. We ate in silence, for it was delicious. A few years later, the steaming bird disappeared from our Sunday spot at the table. It happened right around the time we met the Sandbergs. Imagine the state of your kitchen after cooking a lasagna from scratch. A sink full of colanders, heavy pots, cheese graters. Mixing bowls streaked with remnants of ricotta and egg. Now imagine cooking eight lasagnas, ten crocks of mashed potatoes, 100 calzones, and dozens of layered casseroles with such exotic names as “Almost Plum Nearly” and “Party Beef” while eight children played within earshot. If you’re imagining chaos, you don’t know our mothers. Despite a few missing ingredients (and one trip to the ER), they ran their once-a-month kitchen like born caterers. Our family bought a chest freezer to store our twice-baked bounty. And rotisserie chicken was quietly replaced with a new dish dubbed “Donna’s Chicken” (which seemed strange, since none of us knew a Donna). We ate those beloved freezer meals up until the youngest of the batch went to college. Fast forward a dozen years or so. The kids who grew up seven miles apart have spread across the country, with homes in seven cities and our own friends and families to feed. But somehow we keep weaving in and out of each others’ lives. Julianne and I were roommates during our mutual stint in Dayton. Jill and her husband Andy are raising their new baby a short drive from my brothers’ apartment in Nashville. And this spring Jason and I moved back to DFW, where Julianne is finishing her Ph.D. We sometimes share recipes, too—like this one that traveled from Jill to Julianne to me. There’s nothing more homey than the smell of roasted chicken filling the house on a Sunday afternoon. And that’s just one of the perks of skipping the bagged bird near the checkout line. Preheat oven to 350°. Pat chicken dry with paper towel. 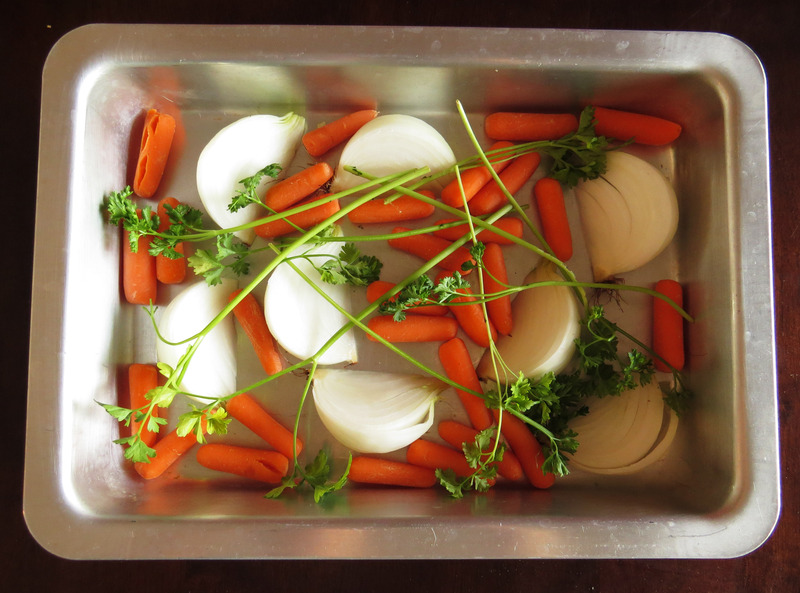 Scatter carrots, onions, and parsley in the bottom of a roasting pan (or a 9×13 baking dish, if you’re like me and don’t have one). Place the chicken in the pan, breast side down; it’s time to get friendly with the foul. 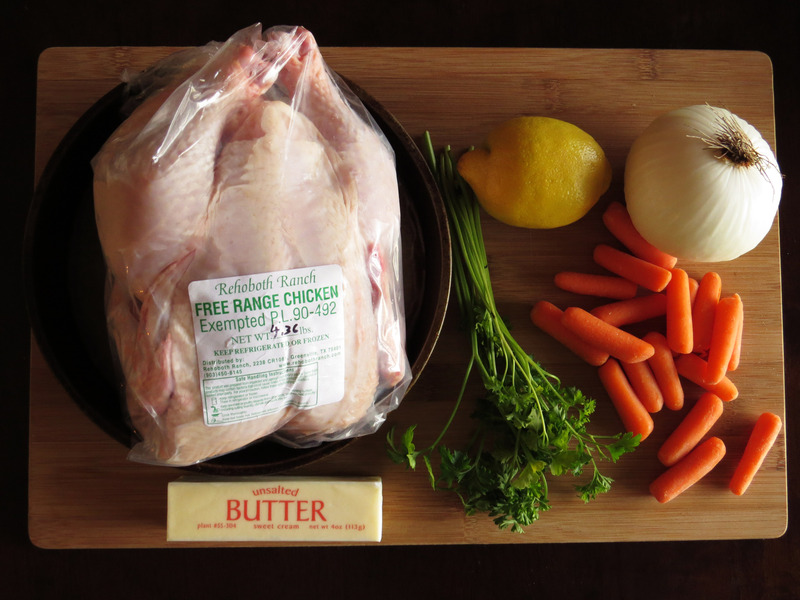 Using your fingertips, scoop up a good amount of the butter and start massaging it along every surface of the chicken. Find some loose pieces of skin, get another scoop of butter, and smear some in the space between the skin and the meat. Season with salt and pepper. Flip the chicken and repeat the buttering and seasoning process on the breast side. Be generous with the salt; when you think you’ve seasoned just enough, give it another shake or two. Insert the lemon wedges into the cavity of the bird. Transfer the pan to the oven. Bake at 350° for 1 hour and 45 minutes, or until juices run clear. 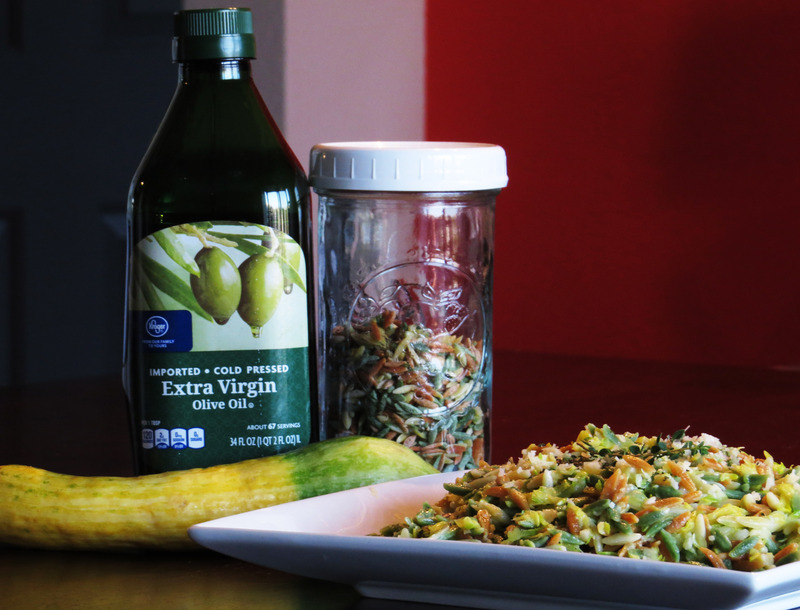 Recipe based on the “Disappearing Zucchini Orzo” found in Animal, Vegetable, Miracle—a fantastic book on farm-to-table living that any cook or gardener will appreciate. Cook orzo according to package directions; drain. Heat olive oil over medium-high heat; add garlic and squash. Sauté 4-6 minutes, or until lightly golden. Combine drained orzo, squash mixture, parmesan, and herbs in a large serving bowl. Stir until thoroughly combined. Serve warm. *I put mine in the center of a clean dishtowel and wrung it over the sink.